'Lovely day' was already a wellknown song in the Eighties in its original version, recorded by Bill Withers in 1977. For a long time, Withers held the record for the longest held note in the history of pop, for he sings one note towards the end of the song for 18 seconds. The record was only broken in 2000, when A-ha recorded 'Summer moved on', in which lead singer Morten Harkets holds a note for 20 seconds. 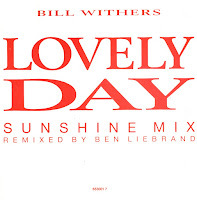 Anyway - when Dutch DJ and remixer Ben Liebrand made his 'Sunshine mix' of 'Lovely day', it became an even bigger hit than the original in the Netherlands. Where the song reached number 24 in 1977, in 1988 it reached number 4. In the UK, this remix reached the same position, although in 1977 the original made number 7 there.